If you didn’t have the ability to see, whose voice would you trust to guide you every day? Who would accompany you on trips, read to you, help you shop? Who would adapt to your routine, pick out your smartest shirt, inform you about the best places to eat, and even remember to record your favourite TV show while you dine? No human could be so constant, so patient, or so responsive. But AI can. Work is already well advanced on many of the technologies that could allow seven million blind and visually impaired people in the Arab world to lead independent lives. Machine-learning algorithms can spot patterns of behaviour and predict what you are likely to need next. Face recognition software can now identify emotions. At Majid Al Futtaim, we have partnered with I.AM+ to develop voice operating systems that adapt to the user, and respond differently based on the context of the conversation. They can now converse in Arabic and any other language. Properly harnessed, these technologies have the power to enrich our lives. Across the world, there is a desperate need for teachers with the expertise to develop the skills needed for a prosperous future. And AI could one day bring those teachers to everyone, tailoring an education programme to the particular needs and talents of each individual child. Somewhere right now there is a mathematical genius staring out of the window in a classroom in a remote village, bored because the teacher has their hands full ensuring 50 pupils can read and write. But that child could become more engaged, challenged and inspired, all for the price of a smartphone. Connected to the right software, every pupil could interact with a virtual tutor that is programmed to match its lessons to their aptitudes and interests. Just imagine the untapped potential waiting to be unleashed. This power of AI to level up can be applied to almost any public service. High-quality healthcare need not be limited to those within a short drive of a major hospital. Diagnostic software can triage patients, identifying the cases that genuinely require the expertise of a specialist purely on the basis of medical need. Improved communications technology and robotics could even put that specialist in the operating theatre of a patient 1,000 kilometres away. Equal access could be provided to all manner of government services. Take a look at Estonia, where every citizen is given a digital identity, and almost every interaction with government takes place online. Blockchain technology ensures security and protects privacy. Bureaucracy has almost disappeared. Again, just think of the time saved by not having to stand in line, waiting for an appointment just to get a piece of paper stamped. AI also has the ability to make our world a safer place. In late 2017, Dubai Police implemented the Oyoon (Eyes) project, which uses AI cameras to monitor criminal behaviour in three sectors – tourism, traffic and brick and mortar facilities. The technology identifies lawbreakers using facial recognition and assisted in the arrests of 319 suspects in 2018, while helping to decrease the number of unresolved crimes in the city by 95.5%. This vision of AI is exciting. But it is not inevitable. We stand between two worlds – the traditional way of doing things is changing, but we don’t yet know what will take its place. The decisions and choices we make now will determine what kind of world will come next and our generation has the immensely thrilling opportunity to lead the transformation. One thing we must ensure is that AI is seen as an assistant which augments human experience, rather than being viewed as a rival. If people feel they are being replaced by computers, they will resist. However, there shouldn’t be a great cause for concern. 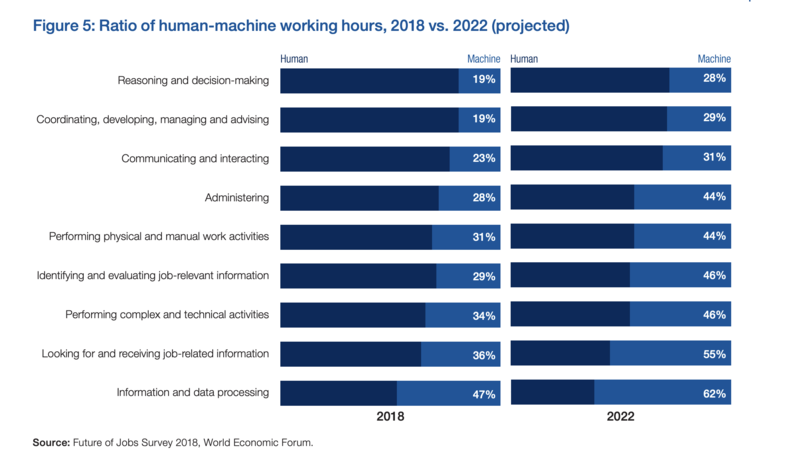 While machines and algorithms are expected to displace 75 million jobs by 2022, they will create 133 million new roles. We should be most concerned about how we reskill and prepare people for those roles. Take the example of self-driving cars. They have the potential to make transport safer, more efficient and therefore less damaging to the environment. But the crucial thing is what will happen to the drivers who currently spend much of their lives behind the wheel. If we get it wrong, we risk leaving them underemployed and resentful. But if we choose wisely, investing that time in teaching and developing new skills, we have the opportunity to move people to a more purposeful and fulfilling future. An essential ingredient to the success of AI is the equality of the data on which it depends. AI learns from its data, so if the data isn’t representative, then AI will learn the wrong lessons. Unimaginable amounts of data have been generated in recent years, and the pace is accelerating all the time. By 2020, it’s estimated that for every person on earth, an average of 1.7MB of data will be generated every second – that’s more information than you can fit into the average textbook. But this data is not being collected evenly across the world, or across different social groups. We have vast amounts of data on the affluent residents of Dubai, but little on the less urbanised parts of the Arab world. That means that many of the algorithms used today are tailored to the wants, needs and experiences of certain groups, and not others, which could lead to AI that is more exclusive than inclusive. Of course, many people feel their world is changing too fast, and are concerned that the more we rely on technology, AI, machine-learning algorithms and computers, the more we are losing some of our humanity. This reaction is understandable, but it fails to see the true and bigger picture. Urbanisation, industrialisation and population growth have made many of our daily interactions more anonymous than they ever used to be. We have become used to being lumped together as ‘consumers’, economic units treated identically. But AI has the power to allow us to personalise the relationship and make us ‘clients’ again – tailoring services to us as individuals with particular likes and dislikes, just like the retail model of old where the local shopkeeper knew their customers deeply, as clients. More than that, AI has the potential to give us back something even more precious – the time to experience the good things in life. Dishwashers, washing machines and riding on lawn mowers freed millions from household chores – and new technologies will go even further. Let the machines take care of the distractions, while we concentrate on what is really important to us as humans.